The Fanex 554, 684, 764 904 and 1124 are designed to perform perfectly in all crop conditions, with a minimum of non-productive maintenance required and with diminished transport dimensions. Featuring a heavy duty fully closed headstock this machine will fit perfectly into the operation of professional farmers, looking for a strong, effective, and versatile tedder. These tedders are fitted with a high performance driveline combination. The complete driveline is maintenance-free, and offers highly reliable transfer of power, combined with extremely compact transport dimensions thanks to a winning combination of u-joints and finger clutch joints (Fanex 764, 904 and 1124). Strong driveline, sturdy u-joints on the inside rotors and flexible HexaLink finger clutch on outside rotors (Fanex 764, 904 and 1124). Fanex mounted tedders offers very compact transport dimensions with its’ new clever folding solution. A parking height of just 3.45-3.80m is possible, due to the implementation of the new HexaLink finger clutch system in the joints of the two outer rotors. The remaining rotors are driven by maintenance-free double universal joints, for strong and efficient transfer of power. During transport the weight of the tedder is close to the tractor, providing excellent weight distribution, even during high speed transport. Vicon’s new generation of mounted tedders are designed to perform perfectly in all crop conditions, with a minimum of non-productive maintenance required. 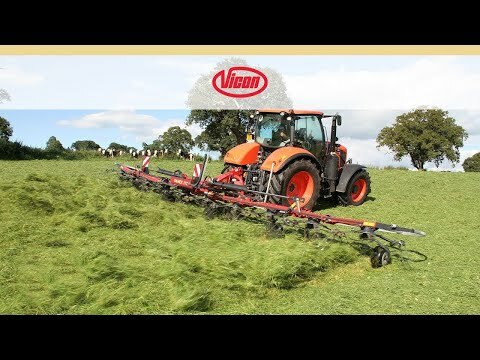 Featuring a heavy-duty fully closed headstock and a strong V-shaped central unit, the machine will fit perfectly into the operation of professional farmers, looking for a strong, effective, and versatile tedder. 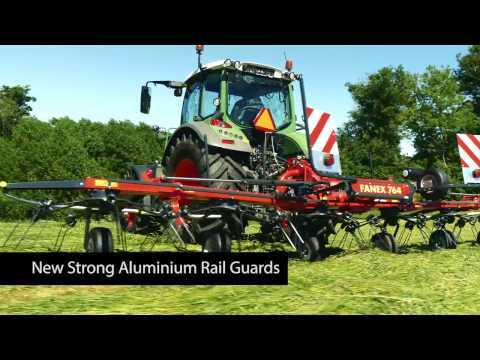 New aluminium rail guards, which are low in weight, but still extremely impact resistant.